I absolutely love my children’s teachers. And they really deserve a special gift at the end of the school year for putting up with my kids the whole year. If I were rich, I’d but them a huge gift card to their favorite store, but since I’m on a tight budget, I decided to make them a personalized, useful gift instead. These DIY Monogram Water Bottles are so easy to make for an end of school year teacher gift. And even easier if you have a Cricut Vinyl Cutter. I used the Metallic Vinyl for these bottles because the bottles are made out of metal and I think they turned out so cool! I might just make one for myself! I bought the insulated bottles because they are so much better at keeping your teacher’s drinks nice and cold through those long school days. You can get the water bottles I used HERE or they have them at Costco right now in a two pack, and the Cricut metallic vinyl HERE. Now let me tell you why I love my Cricut so much and why I chose the Cricut Explore Air™ machine over others. If you are a mom, you need a Cricut. I wasn’t too sure at first how much I would use it, but I have ended up using it at least once a week. Whether it be for kids homework assignments, cards for birthdays (because I always forget to buy a card), decorations for holidays or for visual aids for teaching at church, I use it MUCH more than I thought I would. I just have to list all of my favorite things about my Cricut for you . . . Variety: The Cricut Machine not only cuts paper and vinyl, but it also cuts leather, felt, metal, fabric and probably a lot more things that I don’t even know about or have thought about. Flexibility: I can design anything I want in photoshop, give it a transparent background, and transfer it to the Cricut software and it will cut it out of vinyl. Print & Cut: Those fun things I design in photoshop can also be printed, then cut, with my Cricut. THIS is my most favorite thing about it. Check out my cute Cupcake Toppers and Banner I made using this feature. Cutting Mats: The cutting mats hold my materials nice and snug so there are no mistakes. There are a variety of mats to use depending on what material you are cutting. Writing Tool: You can use the Cricut Markers and Pens to truly customize cards and notes, or create amazing coloring pages for you and your kids. I LOVE this feature! Scoring Tool: The scoring tool helps you emboss paper or use it to crease the paper to create the perfect folds on cards and paper projects. It makes all your creations look professional. Multiple Tools at Once: You can use a pen and a blade at the same time, or the scoring tool and the blade at the same time. It makes it very convenient! 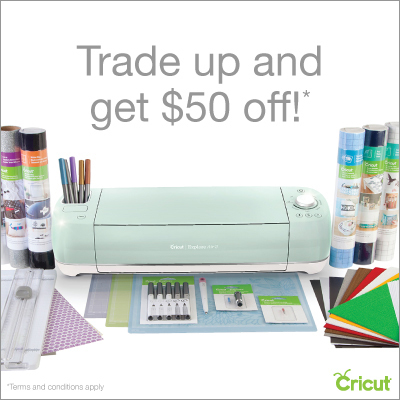 Design Space: The Cricut Design Space lets me use my creativity to make amazing personalized gifts and crafts. But if I’m not feeling very creative, I can choose from hundreds of ideas that they have available right there in Design Space. Cricut has amazing designers create one of a kind projects and cards for you to make for your loved ones and to beautify your home. Now do you see why there really is no other choice? I love how I can use my Cricut machine to bring out my creativity and make my life more beautiful. Let’s get on with making our cute Personalized Water Bottles for our Kids Teachers. I’ve included a video for you to watch so you can see how easy these are to make. Remember you can get these water bottles HERE and the Metallic Vinyl HERE and the Cricut Machine HERE. First learn how to use the Monogram Font in Cricut Design Space in this video. I created mine with the free monogram font from DaFont.com and spaced it together in photoshop, but if you aren’t familiar with photoshop, this is much easier in Cricut Design Space if you just want to purchase the font there. Then see how I cut the vinyl and add it to the water bottles here. To download these free printables, right click on the image and choose “save as” then save them to your computer and then open them and print them. Or you can click on the image to open it in a new window, then right click and choose print. I hope you enjoy these last few days of school and spoil your child’s teacher! Have a great summer everyone!